A documentary about 15-year-old Oksanna who follows her mother's dream to see her become a prima ballerina. "A Ballerina's Tale" (2015 release; 85 min.) is a documentary about the life and times of Misty Copeland, an African-American ballet dancer at the American Ballet Theater. As the movie opens, we see Copeland at a young age (13 or 14?) at a ballet practice. We are then informed how few ballet dancers make it into the elite dancing troupes, and of those that make it, how very, very few African-Americans or dancers with a 'muscular' body make it. After that we start following Misty Copeland , as she goes about her day-to-day routine. To tell you more would spoil your viewing experience, you'll just have to see for yourself how it all plays out. Couple of comments: this is not an earth-chattering documentary by any means, yet it serves a good purpose, namely to shine the light on the lack of diversity in the ballet world. Or, as one of the 'talking head experts' phrases it in the movie: why does ballet look like the Alabama Country Club in 1952?". Or as the New York Times put it in a major article: "Where Are the Black Swans?". Other topics that this documentary looks at include the issue of injuries, which Copeland also has to deal with, unfortunately for her. Ballet dancing at the elite performance companies such as the ABT has become so much more demanding in recent years (and it always was quite demanding before that too). Then there is the footage of Copeland performing. Even though she didn't start dancing until she was 13, you can tell from the footage of those first years how much talent and grace she had from the get-go. Watching Copeland dancing Sawn Lake is pure delight. Final note: from the end credits, it looks like the movie was funded through Kickstarter (it looks like hundreds and hundreds of people contributed). "A Ballerina's Tale" opened this weekend at my local art-house theater here in Cincinnati. The Sunday early evening screening where I saw this at was attended okay but not great. 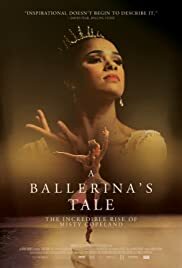 Regardless, if you like ballet, or are simply curious to learn more about the amazing Misty Copeland, you cannot go wrong with this movie, and I would readily recommend you check this out, be it in the theater, on VOD or eventually on DVD/Blu-ray.